You don't have to be Kristen Wiig or Chris Rock to give a toast that's hilarious. 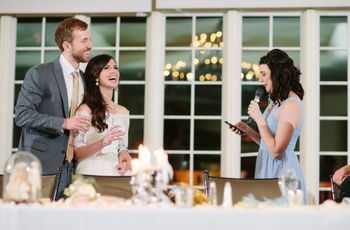 Here’s how to write a wedding speech that will get your audience laughing out loud. You’ve been asked to make a speech at a wedding and you want keep things funny, not sappy. The good news is that you don't have to be Kristen Wiig or Chris Rock to give a toast that's hilarious. 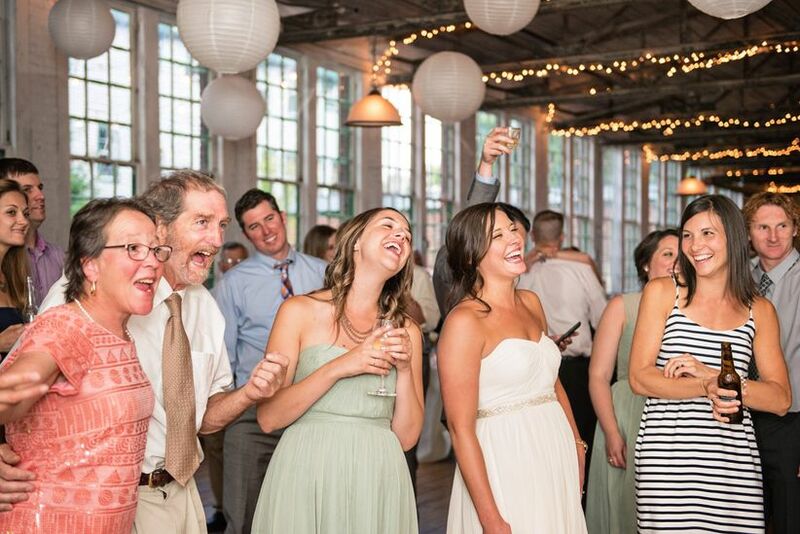 Here’s how to write a funny wedding speech that will get your audience laughing out loud. Need to find some inspiration? Brainstorm ideas while watching your favorite sitcom or funny movie, or listening to a stand-up comic. You don’t want to copy the jokes you hear word for word, but they may spark your own creativity. While it’s tempting to steal a great punch line, remember that you’ll get a better response from a joke that’s original. Wedding speeches only have to be two or three minutes long. If you go any longer, you’ll start to lose people’s attention, causing your humor to land flat. Make sure to practice your speech a lot beforehand. Even the most well-written, hilarious speech will tank if you can’t deliver the lines clearly or with the right inflection. The more you can memorize your speech and deliver it naturally, the better it will sound. 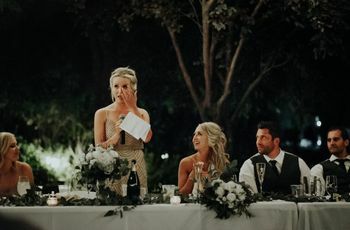 It’s both relatable and charming when the speech-giver confesses, “I’m really nervous.” Guests will be more receptive and forgiving of whatever you’re about to say. Who can’t relate to being anxious when addressing a crowd? Also, remember that most people who are attending a wedding are in high spirits. They’re ready to smile and have a good time. Even a light quip is likely to get a good reaction. Starting your speech off with a question is a great way to get everyone to tune in. Start with, “Has anybody here...” and then include something amusing or hysterical that the bride, groom or couple has done. Was the first time you met the bride or groom particularly comical? Retell the story - it will be entertaining on its own. First impressions can be haphazard and ridiculous, making for great anecdotes. This will also give the guests a glimpse into what the couple’s life was like from the beginning. The more of a history you have with the bride or groom, the more stories you can dip into. Talk about the absurd childhood dreams you shared or the practical jokes you played on teachers in elementary school. Talk about how the bride or groom excels at something you don’t. Poke fun at yourself. 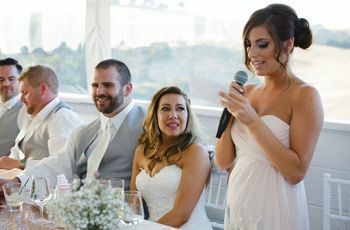 This will get a laugh, keep the speech relaxed and compliment the couple all at the same time. 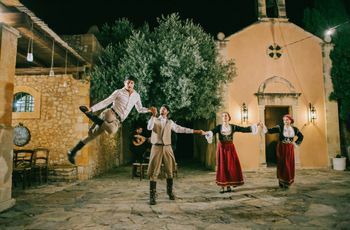 It’s okay to poke a bit of good-natured fun at the bride or groom, so long as it’s within reason. Keep it light. Tease them about their taste in music or their go-to outfit in middle school. Talk about something that will leave them giggling at, not furious with, you. You can also go so over-the-top that people will know that you’re speaking in jest. If you’re not sure if you’re walking that line correctly, though, skip it. Are you a great singer or rapper? Make your toast musical. If you’re a writer or storyteller, cleverly recount a story to entertain the crowd. If you seem to have knee-slapping zingers, string together a few one-liners that all connect to the same theme. Play up whatever it is you’re good at. Props can take some of the focus and pressure off you while boosting a story. 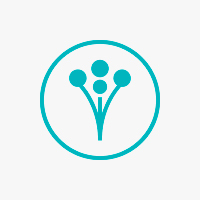 If there’s a prop that will illustrate the main points of your speech, use it! An old photo, childhood toy or relic from your teenage days can make a speech more memorable and silly. If you stumble over your words and end up spurting out something ridiculous that you didn’t mean to say, embrace it, especially if the crowd roars in laughter. That’s the point of delivering a good-humored speech! Speak slowly and pause for a few seconds to let your best lines sink in. If you drop a wisecrack and then immediately continue speaking, people may not catch what you said. Don’t mention exes, tell embarrassing stories or revisit drunken nights. Don’t be unflattering to anybody in attendance. Insulting someone who’s there, even if it’s all in good fun, will make people uncomfortable when they’re supposed to be celebrating. Even if your speech is 99 percent funny, you’ll want to end it on a sentimental note. Wish the couple well, express your love for them and then raise your glass.